The first two photos are courtesy Mike Traverse. 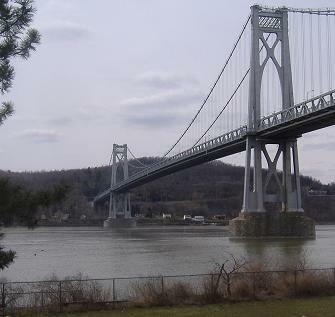 This isn't all of NY 55; follow the big link at the bottom of the page to see what it can do without 44. 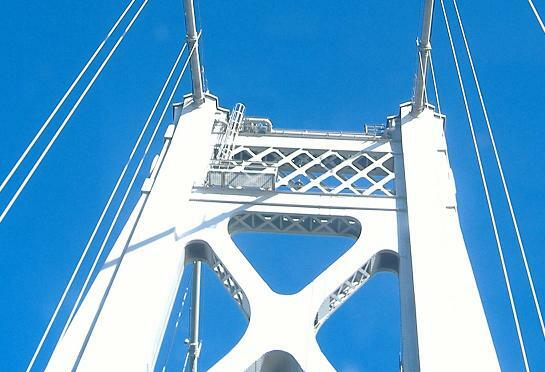 This isn't even all of US 44/NY 55 together, as the second big link will prove. 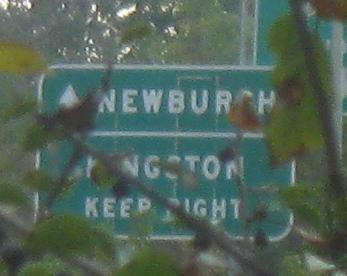 Westbound at the very end of US 44, as you can see, but it's at US 209, which you can't see due to the shield errors. 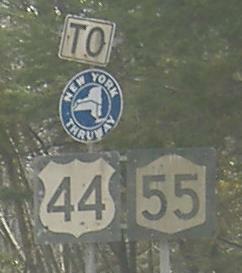 US 44 (westbound here, thanks NYSDOT) ends in just four miles, whereas NY 55 continues quite a distance further. 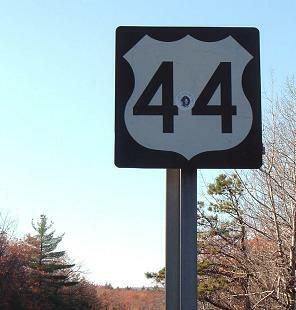 Why US 44 gets signed without NY 55 is a mystery, but it may be as simple as a fallen sign. This guy got it right, the last reassurance before US 44 ends. 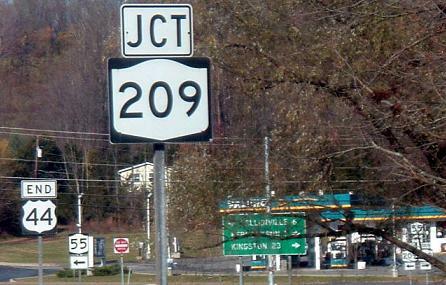 Old fonts and the small size of the Thruway shield date these eastbound shields, six miles eastbound from the beginning of US 44, to the early 1970's or mid-1960's. 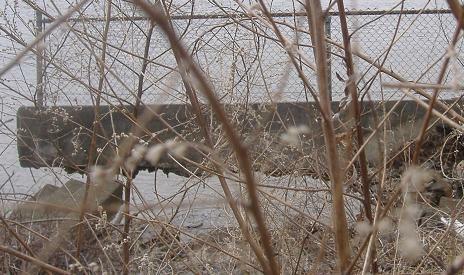 EB over the Wallkill River. 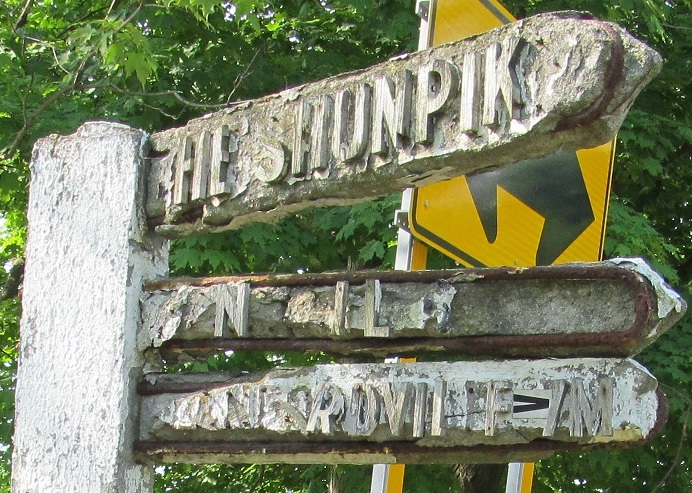 1960's-era signs with old arrows, EB in and past Ardonia. 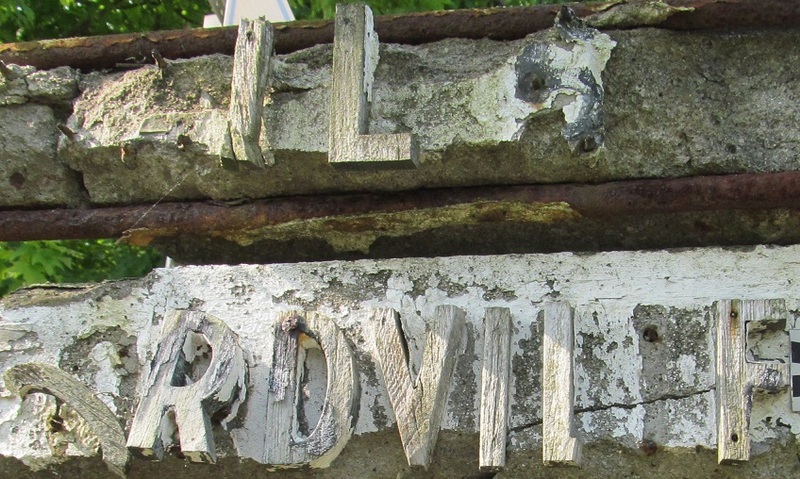 These signs are every bit as old as the Ardonia ones. 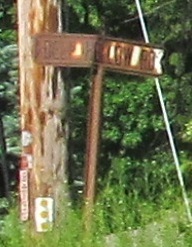 Tillson Ave. NB in Highland. 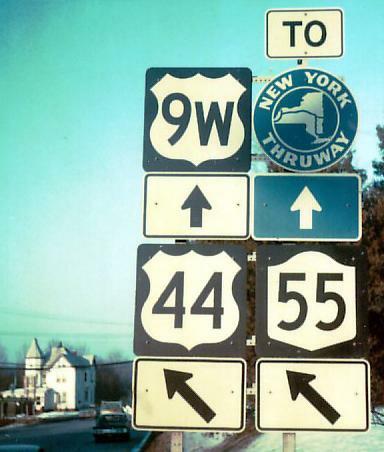 Old signs on US 9W NB/US 44-NY 55 WB just west of the Mid-Hudson Bridge, courtesy Doug Kerr (first, modern photo) and Michael Summa (second, larger, 1976 photo). These are gone now. Never seen this shield before? 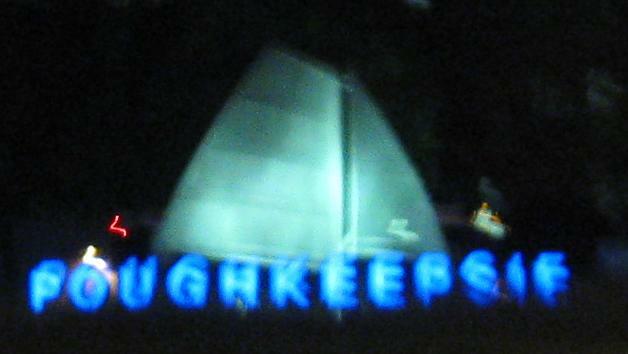 It's on the side of a Bridge Authority building on the Mid-Hudson Bridge approach. 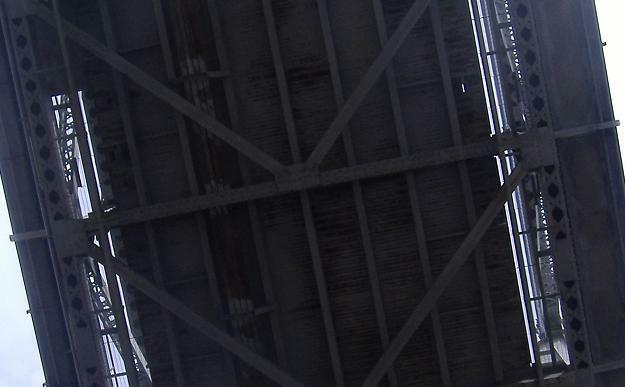 But underneath that psychedelic coloring there appears to be an older shield trying to stand out! 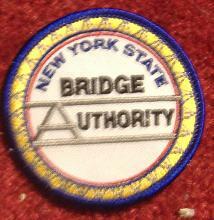 Lying on the red carpet of my room is this 1980's iron-on patch from the NYSBA at the Mid-Hudson Bridge, thanks to the organizers of the 2007 Poughkeepsie Roadmeet. 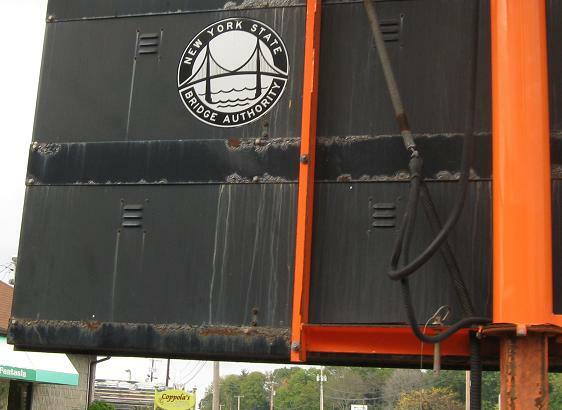 The NYSBA switched logos, and made that huge sign on the side of their building, and people hated it so much NYSBA went back to the original logo (the one with the bridge). 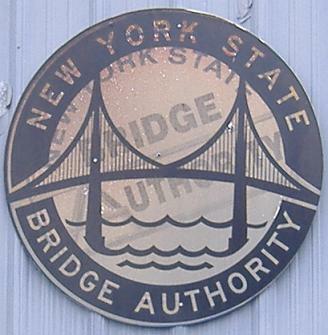 The logo in sticker form on a very temporary VMS, US 9W SB and US 44/NY 55 EB. 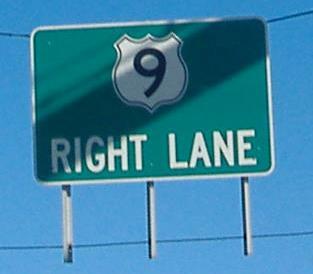 Westbound off the bridge is some button copy at US 9W, and I can't decide which furtive photo looks less bad. 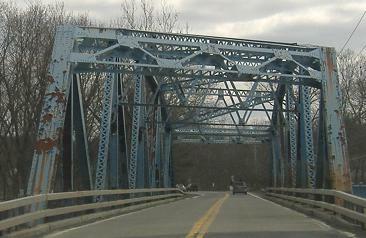 US 44/NY 55 must share a piece of 9W to get to the bridge. 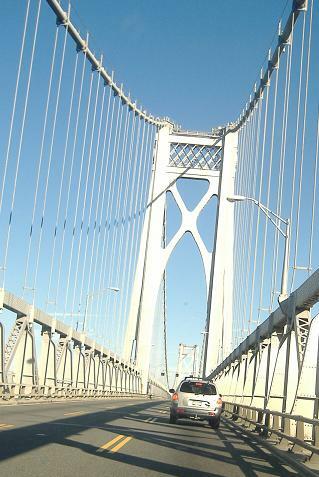 Crossing the Mid-Hudson Bridge eastbound. 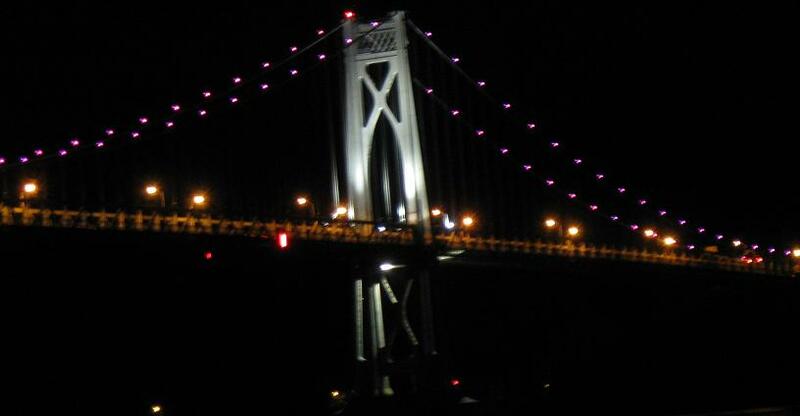 Now crossing it eastbound at night! 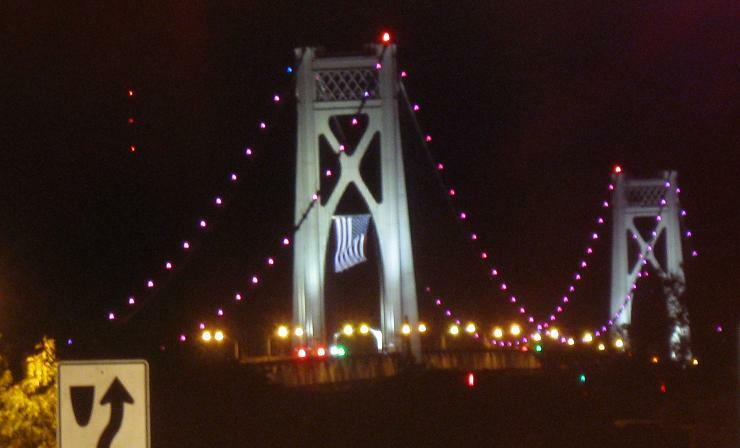 Bridge Authority attempt at a US shield, still eastbound. 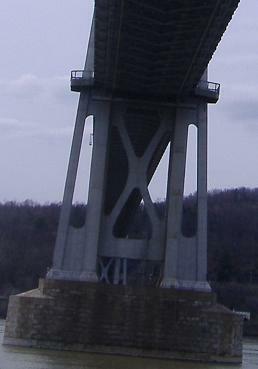 EB and WB, respectively, on the eastern approach to the bridge. 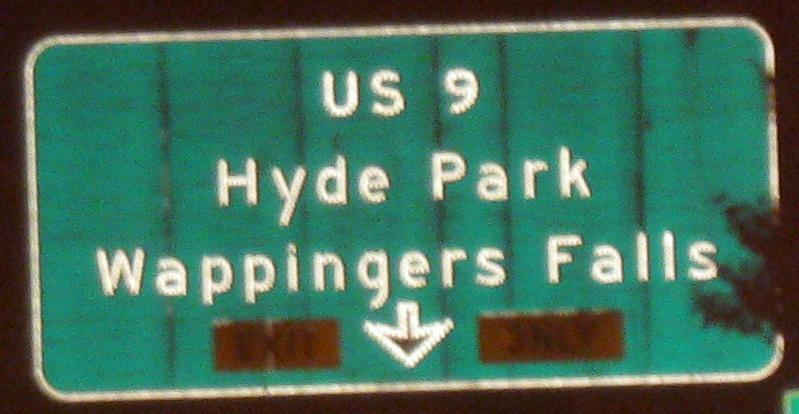 The US 44-NY 55/US 9 interchange is an inner diamond on US 9 without a median break on US 44/NY 55, so to allow for the other four movements there are U-turn ramps immediately upstream of the US 9 NB and SB merges. 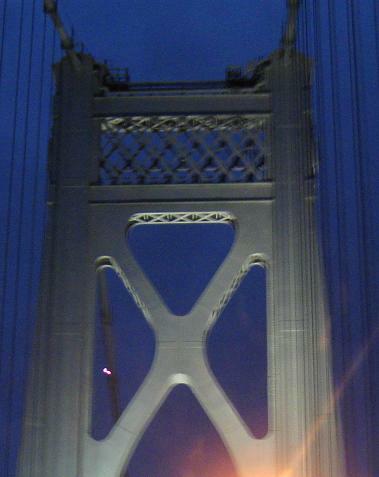 The interchange is shaped approximately like a dumbbell, and it's a pretty dumb interchange - because of the very short left-side weaves (four in all), it can take 30 minutes or more at peak time to get from, say, US 9 NB to the Mid-Hudson Bridge. I have to believe that simply installing a traffic signal on 44/55 and allowing left turns from all directions would make traffic flow a lot better than the current "continuous-flow" interchange. 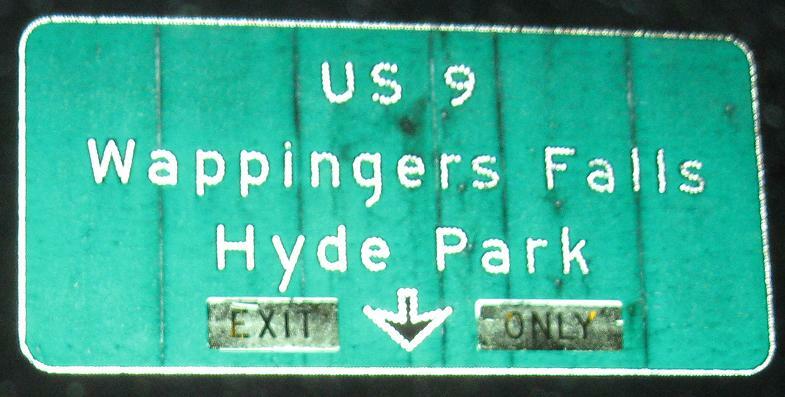 In 1972, the exit sign was as old as the advance sign. Courtesy Michael Summa. 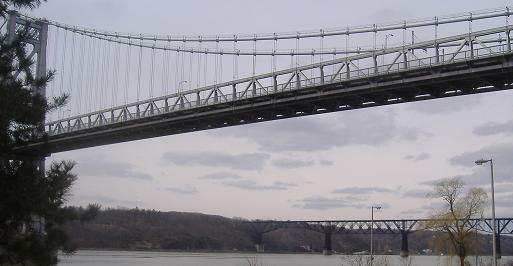 One westbound view of the bridge. 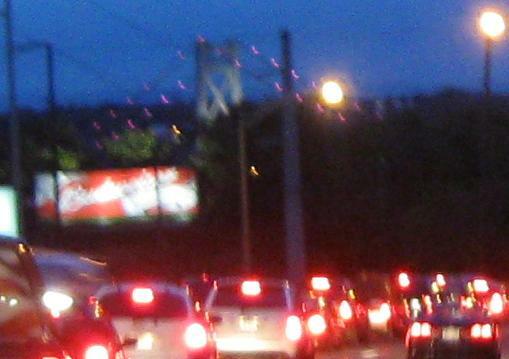 Now on into the city. 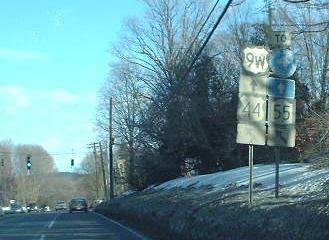 Not NY 44! 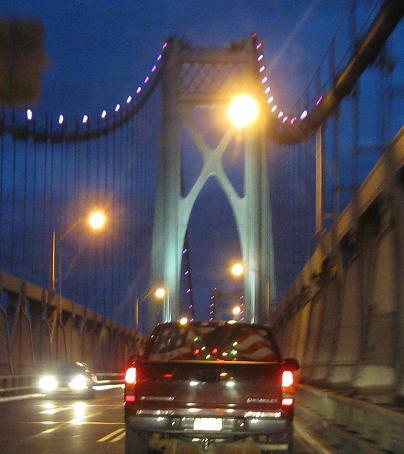 Shame on NYSDOT for mistreating US 44 WB in Poughkeepsie. 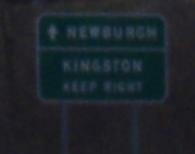 Doug Kerr has already sent me this eastbound version of the same error. 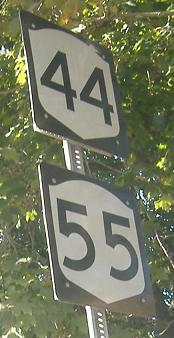 East of the Hudson River, US 44 and NY 55 part ways. 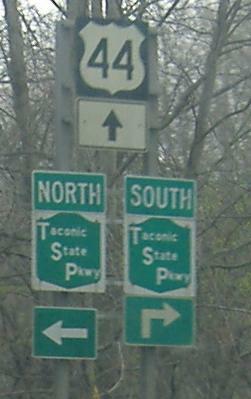 These small shields are westbound; north is left and south is right due to ramp configurations. 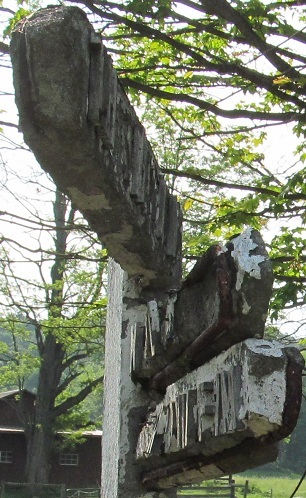 Bangall is probably 7 or 8 miles from this point, depending on how traffic was subsequently routed. I'm surprised souvenir seekers haven't swiped the remaining detachable pieces. 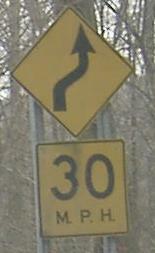 This deadly curve is on NY 22 SB/US 44 WB.